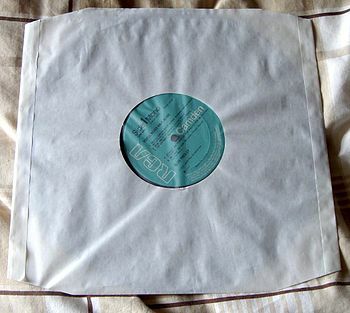 A record sleeve is the outer covering of a vinyl record. Alternative terms are dust sleeve, album liner and liner. The term is also used to denominate the outermost cardboard covering of a record, i.e. the record jacket or album jacket. The record jacket is extensively used to design and market a recording, as well as to additionally display general information on the record as artist name, titles list, title length etc. if no opening presents a readable label. The terms liner notes, sleeve notes are used to refer to this label, jacket information. Sleeves were originally printed on simple cardboard. British manufacturers Garrod and Lofthouse patented a "wrap around" sleeve design commonly seen on LPs in the 1960s. ^ "Gramophone Record Sleeves Patent 943895". 11 December 1963. Retrieved 13 October 2015.